A while back I tried to do an in place upgrade of my http://supportweb.ciaops.net.au SharePoint site to SharePoint Foundation server beta. It didn’t go very well as I noted in this blog. An in place upgrade is not the only migration option you have in SharePoint, you can do a database migration, which I have found to be generally the best way to go from SharePoint v2 to SharePoint v3. 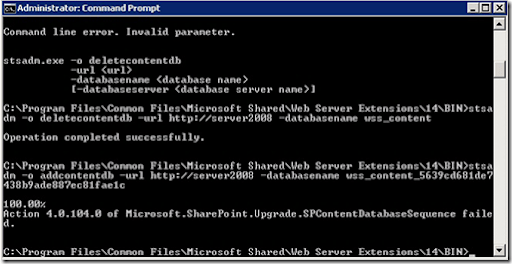 I thought that I’d be able to the same thing from v3 to SharePoint Foundation, however as you can see from the above screen shot the upgrade failed again. It is interesting to note that my http://supportweb.ciaops.net.au isn’t a very complicate SharePoint site. It has a few standard Microsoft templates but nothing else really. Given that I haven’t been able to easily upgrade it worries me a bit that upgrading existing SharePoint v3 sites to SharePoint foundation is going to be more difficult that has been made out. Basically, OneNote is a digital notebook that allows you to save just about any form of digital information. You can use it to save text, images, web sites, files and more. You can even print to OneNote from any application and send information directly from Internet Explorer and Outlook. Best of all, any information in OneNote is not only backed up but it is also indexed, which means you can search through all your notes quickly and easily. Now this isn’t a blog post on the benefits of OneNote it is about how you can connect OneNote to SharePoint to provide shared notebook access. This enables a single notebook to be shared between multiple people. If you have a SharePoint site that is hosted on the Internet you can share this information between people just about anywhere. So how do you go about doing that? First you’ll need to have a SharePoint site with a document library people can get access to. I normally like to create a separate OneNote document library to keep all the OneNote files together but there is no need to do that. You’ll also need to have OneNote installed on every machine that you wish to access the notebooks with. Once you have all that in place and have launch OneNote complete the following to create a new notebook. Select File | New | Notebook from the menu. Give the new notebook a name and select a OneNote template. To allow a shared notebook select the Multiple people will share the notebook option and then On a server. In the path field enter the URL of your SharePoint document library. If SharePoint is hosted on the Internet you will need to logon to the site. The new notebook should appear. Now all any other user needs to do to connect and share the notebook is launch OneNote on their local machine and open the notebook from the URL you used to create the notebook. Next time you open OneNote you will see some text at the top of the notebook indicating that you need to login to get the latest updates to the file. Simply click on this link and enter your login details. Any changes will then be automatically sync’ed. If you don’t have a hosted SharePoint site you can still achieve the same result using Office Live. Information about how to configure that can be found in a free document I created a while back which can be found at – http://www.slideshare.net/directorcia/onenote-and-office-live. The good thing about sync’ing OneNote is that not only do you retain a local copy but there is always an offsite backup. So you can keep using OneNote on the road and when you connect back to the Internet all changes in all notebooks are synchronized. It makes it a very easy process for any team collaboration. So there you are. If you haven’t looked at OneNote I’d recommend you do and if you can link it to SharePoint to provided shared notebook access I’m confident that it’ll prove a winner with most teams. The facts are that most people still prefer email to other forms of information delivery, be they Twitter, Facebook, blogs and so on. In recognition of that fact I’ve create two mailing lists that people can use to keep up to date with what’s on offer from the CIAOPS. Subscribing to this list will keep you up to date on when we run our regular webinars. Emails will be sent prior to each webinar so you have plenty of time to indicate your interest. You can also visit the archive of these webinar announcements at any stage also. If you haven’t seen any of our webinars head over to the CIAOPS You Tube channel (http://www.youtube.com/user/directorciaops) for some examples. We announced this a while back but it seems appropriate to once again provide people with the details of how to obtain our regular newsletter. The newsletter is aiming to come out each month with technology information and productivity tips aimed at helping you get things done. You can also view the archive of these emails as well at any time. Information about the webinars and the newsletter will still be published here, so if you are a regular reader of the blog then there is probably no need to sign up for either. However, if you know of anyone else who may benefit from what we offer via these emails lists then I’d ask you to send the link and get them to sign up. One of the best applications I have found is Evernote. Basically you can think of it as an electronic notebook. In many ways it is similar one of my other favourite applications (OneNote) but has a number of differences that still make it something I use regularly. One of the main areas that I thought Evernote lagged OneNote was the in the way that it presented information. I like OneNote’s ability to easily create and organize information via sections and tabs. The new version of Evernote is certainly a step closer to being as easy to visualize as OneNote, although it still has a ways to go. Probably the biggest plus Evernote has for me is the ability to access and add to your information via a browser. You can of course use an application that you load onto just about any platform, but it is this ability to access Evernote information via a web page that put it above OneNote in functionality I believe. I always found it handy if I was ever on a customer’s machine to take a screen shot of the error. With Evernote I could save that information directly via a browser and have it sync’ed with my desktop machine upon my return. There is still a place for OneNote and Evernote in my took kit but the latest Evernote version 3.5 is certainly getting closer to including all the bits I like in OneNote. Even better, Evernote is free to use and you can’t beat that for value. For those who are interested in an experiment on lifestyle design and the work/family balance then I would suggest you have a look at the TV show “The Nest” which is shown on SBS Australia currently on Friday nights from 8.30pm. that allows you to watch past episodes (although you only seem to be able to watch the very last one). If you are interested in productivity then it is not only worth watching but also reading some of the comments that are made about the episodes by web site visitors. Party Like It’s $19.99 Off ! – All Rolled Into One Sale! PARTY1999 and you will receive $19.99 off EACH ITEM you order. and if you enter the code PARTY1999 when you purchase you’ll get $19.99 off. So if you have been thinking about it you have until January 31 to take advantage of this offer. Part of the Windows SharePoint Operations Guide is a DVD that not only contains my own documentation but also other SharePoint documents. It also contains a number of SharePoint videos, installation files to allow you to get SharePoint up and running quickly without all the downloading as well as links to many other SharePoint resources. You can now download a document that shows exactly what the DVD includes. Because the DVD is part of the Windows SharePoint Operations Guide subscription it also gets updated as new content becomes available but at least the download will give you some idea of what the DVD contains. Don’t forget that you don’t have to purchase the Windows SharePoint Operations Guide to benefit. Referral incentives are also now available. You can download this brochure and send it to people who maybe interested. For more information about the Windows SharePoint Operations Guide please don’t hesitate to contact me via director@ciaops.com. This webinar will show you how to get the best of out of your Microsoft Office applications when used in conjunction with SharePoint. You learn how to utilize check in and checkout with Word, how to embed an updating Excel graph into SharePoint, how to link SharePoint calendars to Outlook, how to create a synchronized notebook using OneNote and much more. The webinar will also be available as a recording after the event of you are unable to attend on the day.